Long driving day today. After eggs, we drove east – first to Vic, then on towards the coast. Tried to find the Tuesday market in Vic, but it’s another very large town and we gave up. East of Vic we had a very long descent through the mountains and many tunnels. Some very nice semi-alpine scenery. After the mountains we hit the plains and stopped for gas. It was one of those stations on both side of the road – our side was automatic only. Unfortunately, the screen was hard to read, plus in Spanish, and I was having trouble (after it ate my credit card.) But the attendant came from across the highway to help out and got us squared away. Very helpful guy; even pumped our gas. 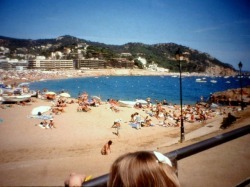 Our first stop on the coast was Lloret de Mar. A super-tacky British resort town complete with a Burger King, mini golf, etc. 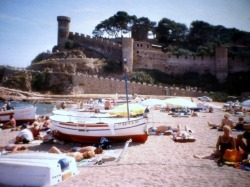 On the recommendation of the internet house rental guy, we drove up the coast to Tossa del Mar, a very nice town with 12th c. wall, old town, beach, boats, etc. After driving through the extremely narrow streets, we walked around and had a very nice lunch in perfect weather, outdoors. Dave – Gazpacho, fried squid – Jill Catalan salad and roast chicken. Took the boat from 3-4 p.m. up the coast. The water was crystal clear and azure blue. Very surprising to me. I thought the Mediterranean was polluted. We didn’t see much in the way of fish but went in a few caves and had a nice ride. 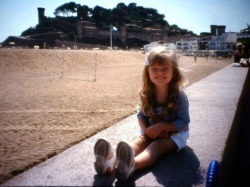 We found a local playground for Kristen to stretch her legs, then drove up a very scenic coastal road to Sant Feliu. It was sort of like the California coast with no guardrails. Beautiful water and weather. Skirting in and out of many coves. Then a long (2+ hour) drive back home, arriving at 7 p.m. just like yesterday. Around 8:30, Nuria and her mother-in-law Dolors Pratt arrived. 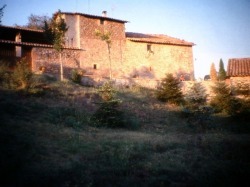 Dolors manages the rental house. We had them in for about 20 minutes. We straightened out the whole dual signature travelers’ check / deposit thing (they had not yet cashed them), paid her the remaining $550 in cash, and had an English / French / Spanish chitchat. They also told us we can stay in the hotel Friday night for free, since we’re only getting 6 nights out of the house rental. We were planning to go to France, but how can you say no? These people are so nice, the food is good, why not? Then to top it off, while we’re eating dinner Jordi comes over to our table, gives us $100, and says “This is from my mother. She says the house for September is only $700, not $800 like July and August. Plus there’s only 3 of you for 6 nights. Please take the $100 back.” Unbelievable. What a great place. Jill had vegetables and steak, I had fish soup and Catalan sausage. Followed by lemon sorbet. Slept from 11-8 and I think this may be the last day for my cold.